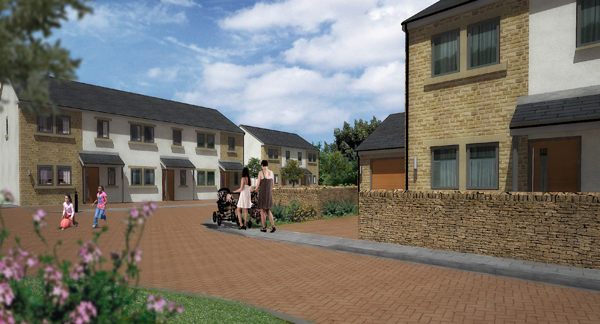 We have recently been appointed to provide architectural services for the above project, and have submitted a full planning application to Bradford Council’s planning department for a new affordable housing scheme close to the centre of Wibsey, about 3 miles to the south of Bradford City centre. The site is surrounded on all sides by established housing and a couple of Public houses, and has been the subject of numerous planning applications over recent years. Although obtaining planning permission will be no easy task, we have been in preliminary discussions with Bradford Council’s planners, which have been generally positive, and have formed the basis of our submitted proposals. We have tried to ensure that we include as much greenery as possible within this scheme, given it’s location, and have also added in softer features such as dry stone walling, as opposed to fencing to the boundaries, and terracotta block paving to the areas of hardstanding, as opposed to tarmac. Although the general appearance of the proposed dwellings is a contemporary one, we feel we have softened the overall character of the proposal with our landscaping and hardscaping proposals.